Question: What happens when over 100 artists congregate to listen to amazing music and sketch two terrific models dressed in outfits that belong on some runway straight out of a Giger drawing? I wish I knew all the artists there, for over the course of the night I met person after person who are some of the top artists in the industry. The night started with Julie and Lavendar at two stations, but about twenty minutes in, with so many people, Bob, the guy in charge, asked for a volunteer to work a third station. Someone stepped up (didn't get her name - *edit - Marla Trudine), and did as good a job as the other two, costumed and all. Where else could that happen? The costumes were done by this guy Louise and the music in the background was terrific. I probably own a third of the songs played, with the desire to chase down the other two thirds. My favorite part of the night was when I got into a conversation with this guy, Gabrielle, who deservedly won the award for best sketch of the night. We were talking about how we'd both printed out version's of Andrew Loomis's books because A) they're the best and B)they're no longer in print. The very next conversation I had was with this guy Kirt. I was looking through his sketchbook, and noticed that he used a similar tecnique to Neville - he admitted that was the guy who influenced him for that style. 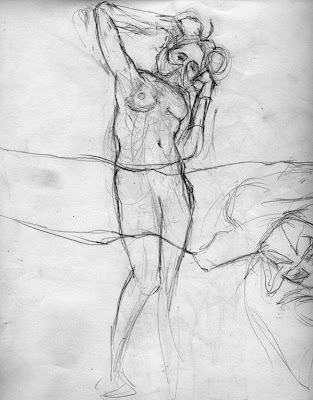 Then I saw some anatomy drawings taken straight from "Figure Drawing for all it's Worth" by Loomis, and he said-yes, that is indeed the source. He and I were both impressed I was able to reference two of his sketchbook pages. He said he loved Loomis, but no one else had ever heard of him, which surprised me. He actually had a book of Loomis's in his backpack. When I asked him how he'd gotten a hold of it he told me he'd shelled out 200 big ones for it-money well spent. We took it over to Gabrielle, and he was amazed that five minutes after we'd had the conversation about Loomis's impossible to find books, we were flipping through one. So, I had a blast-ended up staying till midnight, listening to Tim Biskup as the DJ, and talking with a really nice group. I wish more people had stayed for the after party. Next time. It's always great hanging out with brilliant, talented artists. The sketches, of course, are from the event. 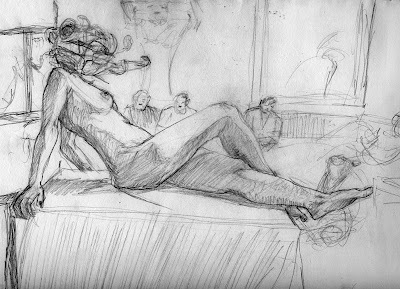 I look forward to future Dr. Sketchy's, and getting as many excuses as possible to go to the Medusa Lounge. Edit: Bob linked back to this post on the Dr. Sketchy site, a high compliment and much appreciated. Quite frankly, it made my morning.